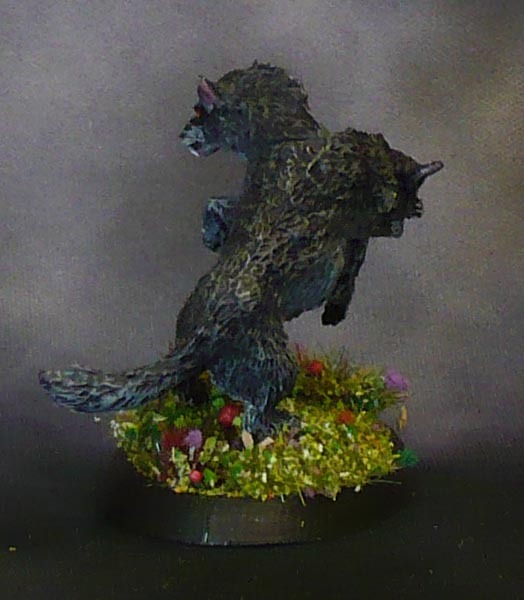 In the spirit of getting things done, I have just been grabbing some minis off the Trays of miniatures I am going to get round to any day now oh yes for sure that definately is going to happen to paint in parallell with other stuff where I use the same colours. 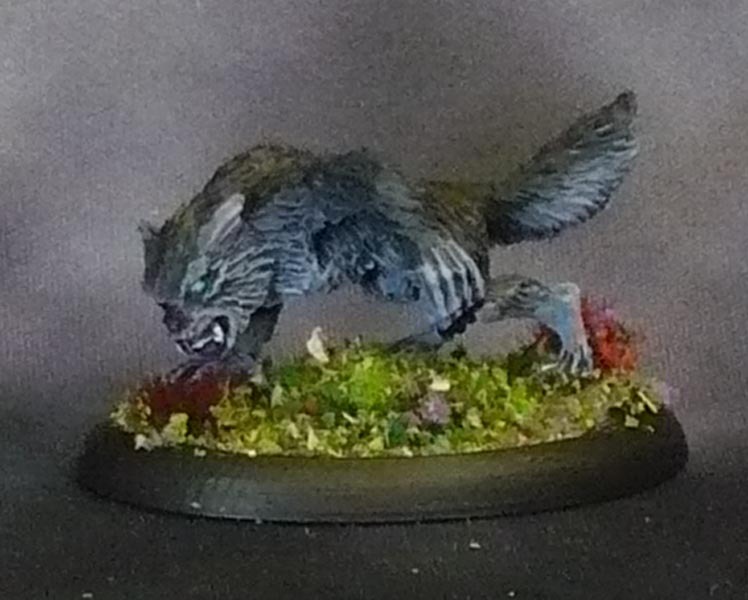 This time I did some more werewolves (and a death dog). 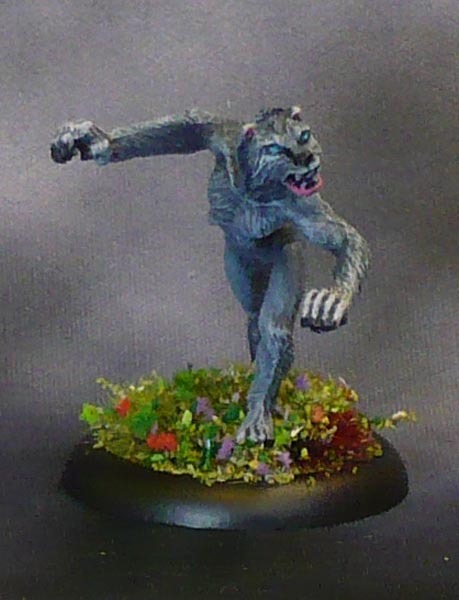 From left to right, Bear’s Head Miniatures Werewolf. 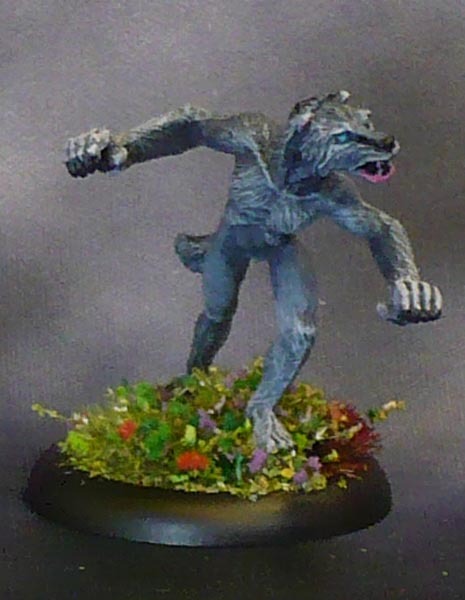 Reaper Bones Death Dog, Reaper Bones Werewolf, Ral Partha Ravenloft Man Wolf. 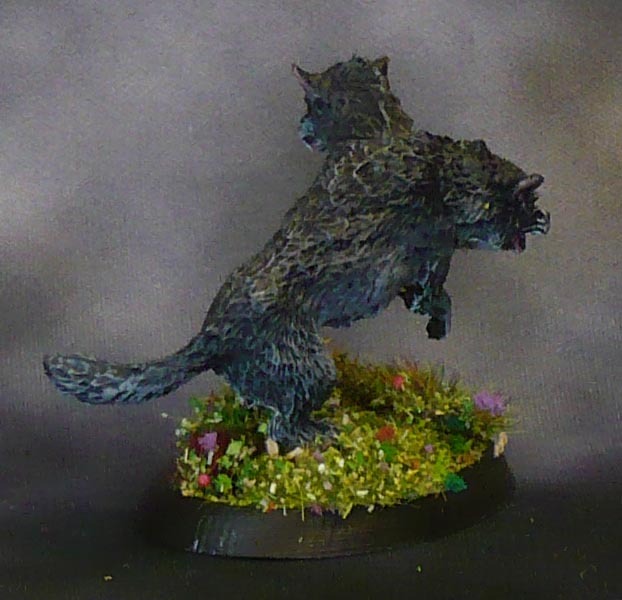 This is one of the miniatures from the 2018 Wilderness Encounters kickstarter. 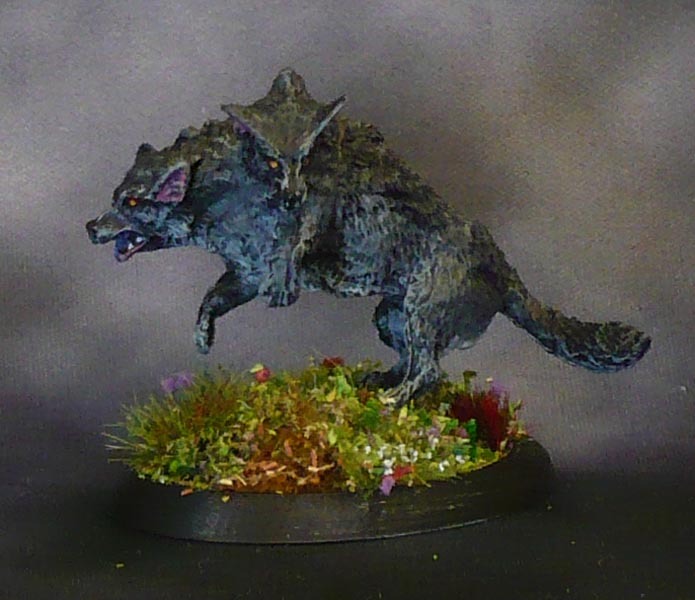 Currently available from the bearsheadminis.com webstore. 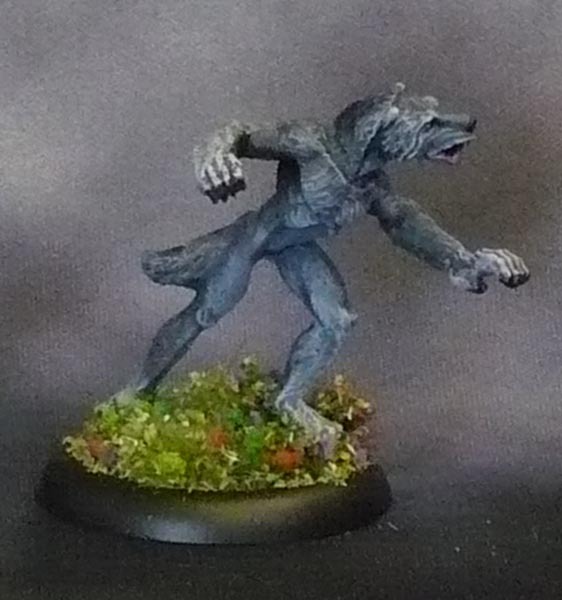 Quite a nice werewolf with a less pronounced snout than most other werewolf sculpts. It reminds me of the 1981 original version of the movie An American Werewolf in London. Sculpted by Philip Hynes and cast in metal, two parts. 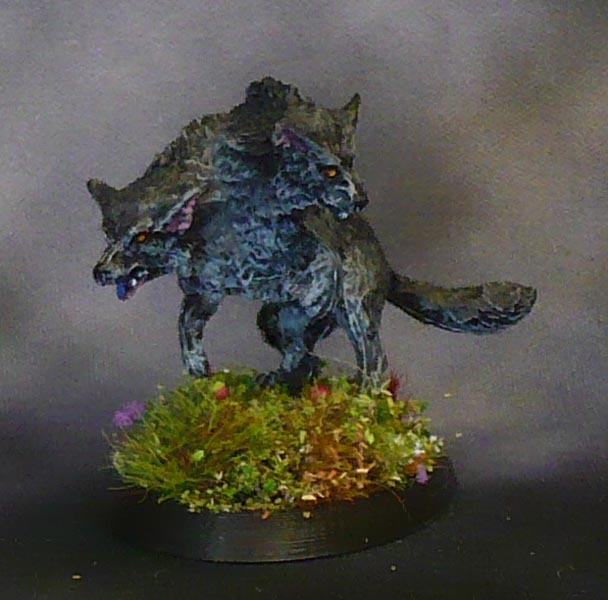 I made a bespoke 3Dprinted 45x30mm base for it. 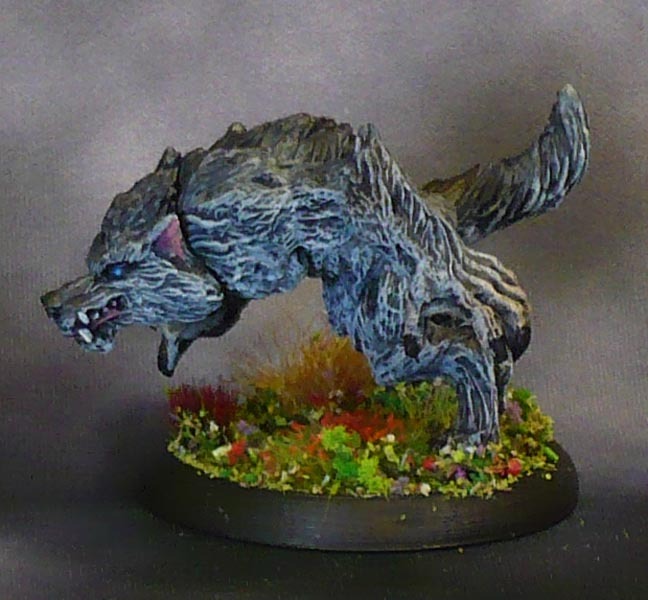 Reaper Bones 77407: Death Dog from the third Bones kickstarter. 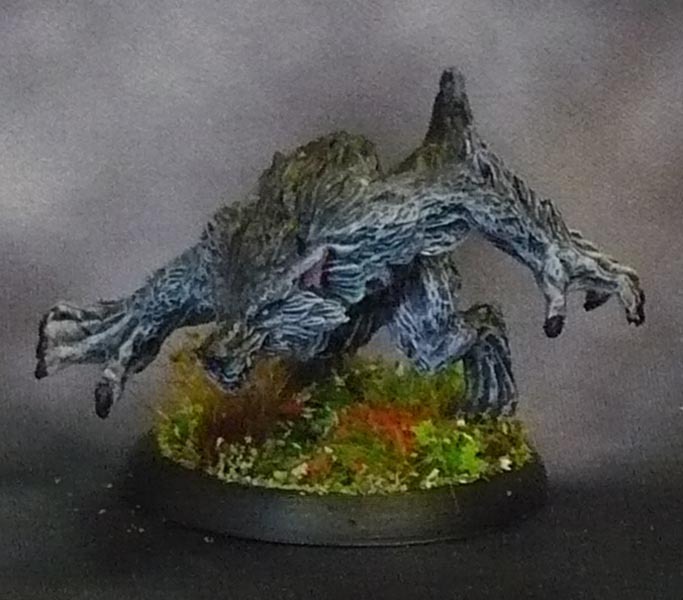 Currently available from the reaperminis.com webstore. Sculpted by Julie Guthrie. 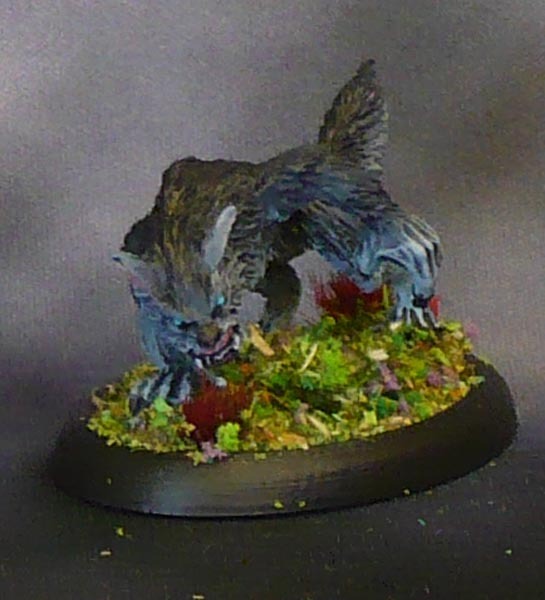 I made a bespoke 3Dprinted 45x30mm base for it. I went for a black dog with red demonic eyes for this. 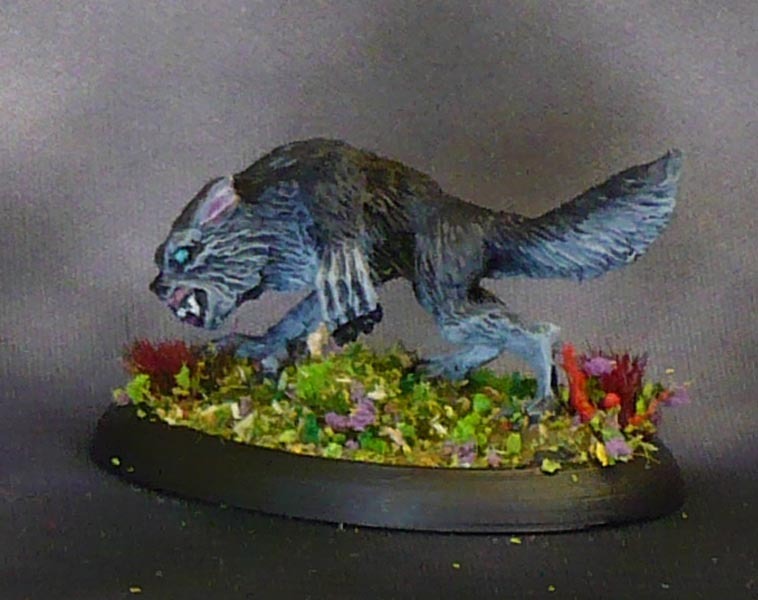 Reaper Bones 77464: Werewolf from the third Bones kickstarter. 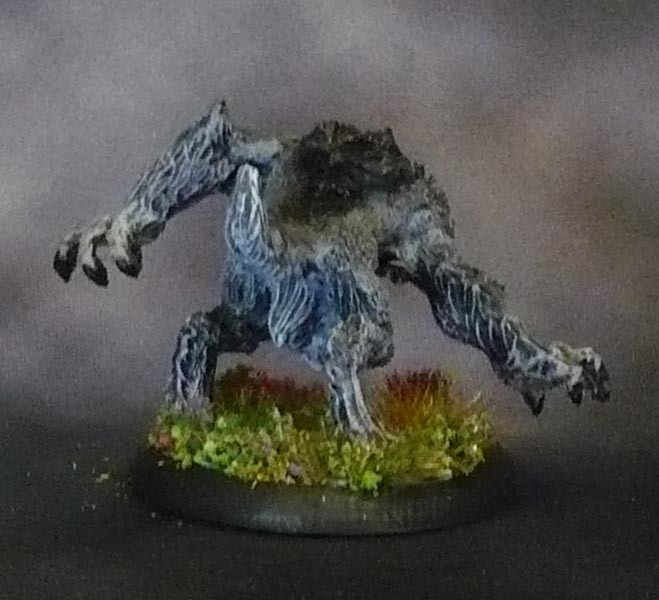 Currently available from the reaperminis.com webstore. Sculpted by James Van Schaik. 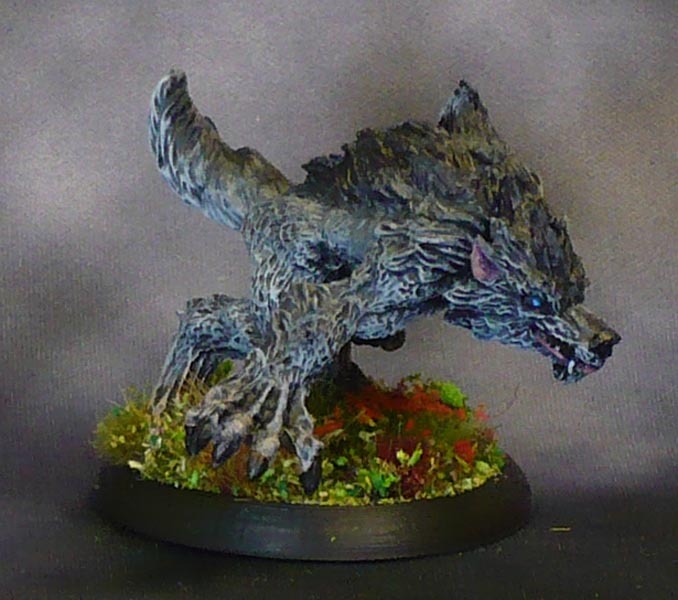 I made a bespoke 3Dprinted 40mm round base for it. 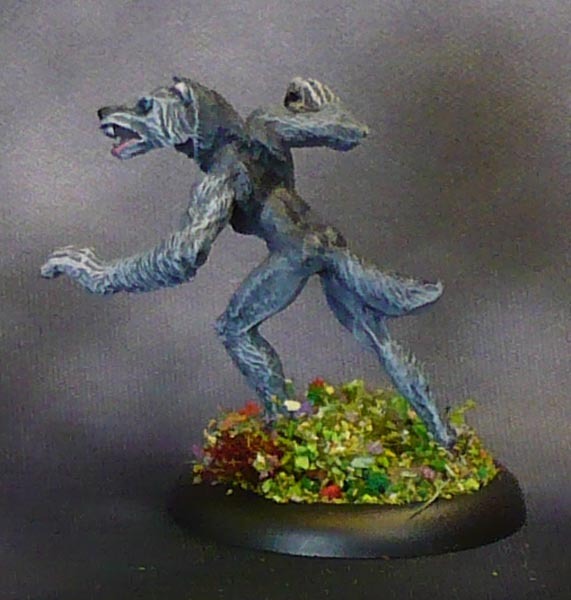 Ral Partha AD&D Ravenloft 11-117 Man Wolf from the mists of time… I bought this mini sometime in the 90s. 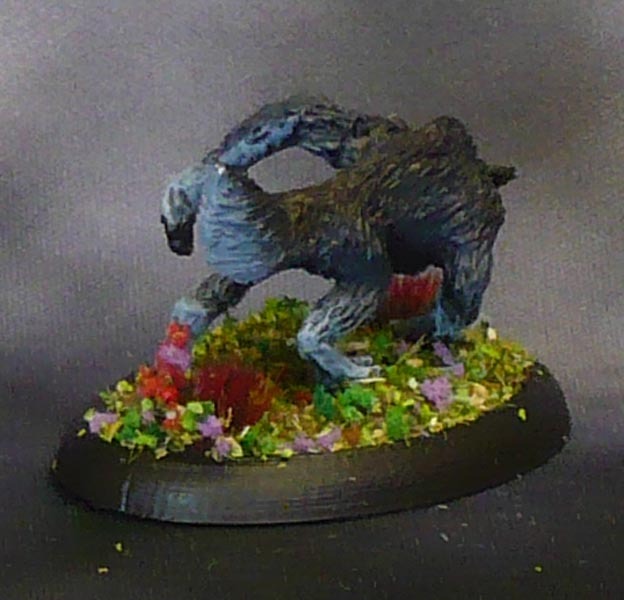 It really looks weedy and even a bit feminine when compared to the newer minis. 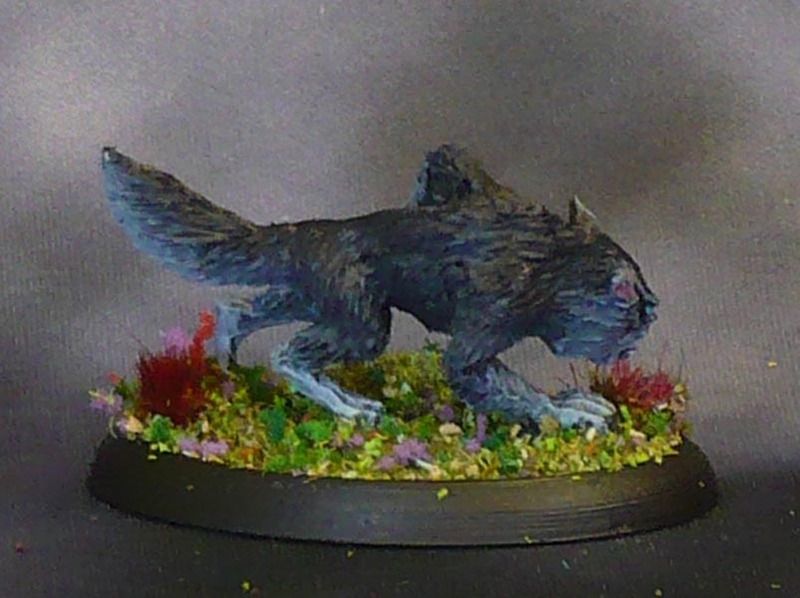 Might have something to do with the old Ral Partha 25mm scale both being smaller and more true to scale than most current minis. Sculpted by Dennis Mize. Single piece metal casting with integral base, I mounted it on a 30mm lipped round. 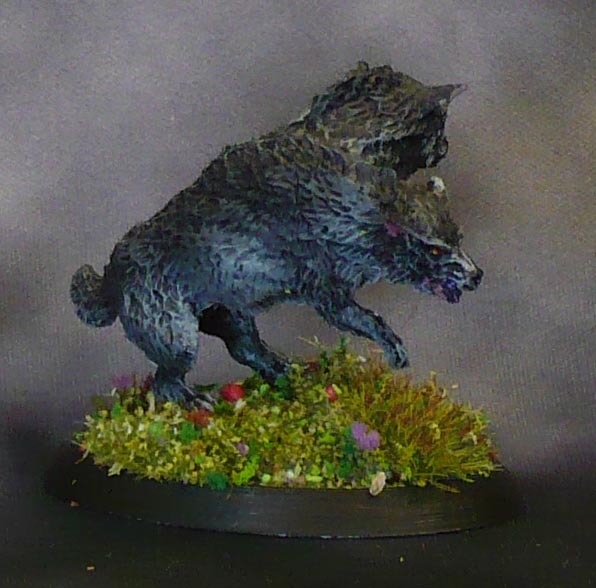 I believe this mini is not currently available.